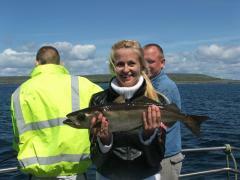 Welcome to Galway Bay Fishing - A unique and novel way to experience Sea Fishing in Ireland. Explore the waters of Galway Bay and the Aran Islands with Skipper Kevin MacGabhann on board our 43FT Aquastar (Maighdean Mara). If you're a fanatical fisherman or just want a new way to relax for a day you've come to the right place. 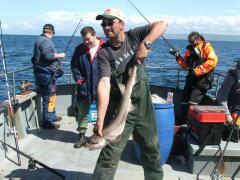 Sea fishing is a perfect activity for a stag weekend or a Birthday celebration outing. 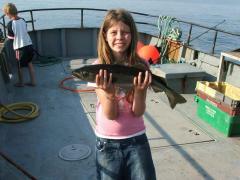 Fish for Shark, Cod, Ling, Pollock & Ray amongst other species. Whether you're living on or visiting the west coast of Ireland or just visiting our great country for a holiday, Sea fishing is a great way to relax and an even better way to see the spectacular west coast of Ireland and it's surrounding islands! What a beautiful catch! Irish sea waters are home to hundreds of fish species, Take an opportunity to see how diverse our fishing waters are and taste our amazing fresh fish for yourself. For day trips, boats depart from Spiddal Pier approx 9am and returns approx 5:30/6pm depending on tides. 20 minutes drive from Galway City. We promote & practice conservation of our Irish water species - If you are not going to eat, don't keep it!